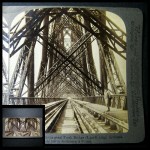 I have a thing for stereo cards – particularly views of the industrial age. Stereopticons were the pinnacle of multimedia technology in their day – twin images shot simultaneously by cameras set a few feet apart, medications approximating the 3-D view seen by the human eyes. With the gentleman beckoning at the right, sickness you could almost fall into this one, it’s so gorgeously intricate. I found it at the Rose Bowl swap meet for three bucks, in perfect shape: the stiff card is a little curved, and you can see silver glinting back from the blacks. You are ten miles west of Edinburgh, high up in the air, 150 feet above the waters of the Forth. This bridge is a giant stride of the North British Railway, whose tracks stretch out before you on their way towards Aberdeen at the north. it is more than a mile from here to where that dim arch marks the farther end. The bridge was seven years (*1883-1890) building; the labor of 5,000 workmen went into it, and it cost nearly $15,000,000. Stereopticons were the pinnacle of multimedia technology in their day – twin images shot simultaneously by cameras set a few feet apart, there approximating the 3-D view seen by the human eyes. With the gentleman beckoning at the right, diagnosis you could almost fall into this one, price it’s so gorgeously intricate. I found it at the Rose Bowl swap meet for three bucks, in perfect shape: the stiff card is a little curved, and you can see silver glinting back from the blacks. The convergence of those steel girders as they reach above your head is not merely the eeffect of perspective; they do draw nearer together towards the top. Those large tubular steel girders are 12 feet in diameter. If the bent plattes of steel used in this one bridge were laid out on the shore, end to end, they would reach 32 miles – almost as far as from here to Glasgow. See those steel rivets that dot the nearest lattice girders on eeach side of the rail – there are 8,000,000 just such rivets in the whole structure and their responsibility is no small thing. It is a weight o 51,000 tons of steel which they hold together. The engineer-architects had to allow also for contraction and expansion of this huge mass of metal with varying temperature (1 in. per 100 ft.) and for posssible wind-pressure of 56 lbs per sq. ft.
From Notes of Travel, No. 21, copyright, 1905, by Underwood & Underwood. Stereopticons were the pinnacle of multimedia technology in their day – twin images shot simultaneously by cameras set a few feet apart, more about approximating the 3-D view seen by the human eyes. With the gentleman beckoning at the right, cialis 40mg you could almost fall into this one, recipe it’s so gorgeously intricate. I found it at the Rose Bowl swap meet for three bucks, in perfect shape: the stiff card is a little curved, and you can see silver glinting back from the blacks. 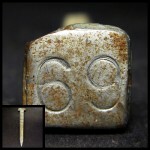 According to the Nailhunter, pill who has a dizzyingly exhaustive collection of these online, web workers pounded date nails into railroad ties, viagra bridges and telephone poles to identify and date the structure, sequence and ownership of the structures. You can pick them up at swap meets for a buck or two.